Aquafine has the largest installed base of water purification process applications in the Life Sciences and Pharmaceutical industries, meeting the demands of United States Pharmacopoeia (USP) and Water-for-Injection (WFI) applications. With 60 years experience Aquafine ultraviolet water filter products and services are found in both the pre-treatment and process areas of many water filtering systems. While commonly found in disinfection and ozone destruction applications they work equally well in Total Organic Carbon (TOC) reduction and chlorine/chloramines destruction. Whilst these systems have traditionally used low pressure lamps, the latest series for chlorine/chloramines destruction equipment utilizes medium-pressure (MP) technology providing a reduced footprint and increased efficiency in both dosage and cost. Typical use of UV water filtering systems can be to add multi barrier protection when used after carbon filters to prevent breakthrough of pathogens which prevents the cost of disposing of faulty product. Used pre Reverse Osmosis (RO) it has been proven to reduce costs by extending the maintenance period of the filter. The use of an ultraviolet water filter has several inherent advantages. Nothing is “added” by the water purification process to the water stream such as colour, odour, flavour, or chemicals and nothing is created such as harmful disinfection by-products (DBP). By the application of UV light, ultraviolet water filtering systems offer a fast, efficient, cost effective and environmentally responsible solution for your water treatment needs. Ultraviolet water filter systems can be mounted horizontally, vertically, or in skid mounted systems, maximising installation flexibility and preserving floor space. For those requiring validated systems we can provide UV lamp and sensor traceability along with the necessary certificates. This can be backed by third party Bioassay on the systems using amalgam lamp technology. All systems comply with cGMP and FDA requirements and sanitary connections conform to DIN and USDA 3A standards. With Life Sciences UV system designs, unparalleled in performance, Aquafine is committed to providing superior quality and the latest advancements in UV technology. This is the most common UV water purification process. 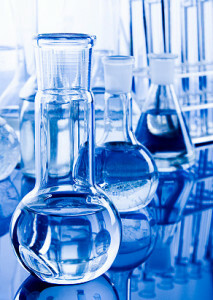 A pharmaceutical water system could have several locations where ultraviolet water filter equipment would be installed. Some typical locations of installation would be post-carbon filter and pre-RO. When installed downstream of the carbon bed and/or directly upstream of the RO unit, a UV system can significantly reduce the microbial counts by destroying at least 99.9% of the bacteria present in the influent stream. Disinfection is also recommended for the process distribution loop and pre storage tank. The USP 31 regulations require an upper limit of 500ppb for TOC for both USP Purified Water and WFI. Aquafine uses a powerful 185nm wavelength appropriately sized and designed to meet this application. Ozone is commonly used in the pretreatment area of a water system, as well as for sanitizing and re-circulating systems. Prior to the point-of-use, the residual ozone needs to be destroyed to ensure the process water is not compromised. Because it is a non-chemical, fast acting mechanism, the UV water purification process is the preferred method for this application. After considering the appropriate variables, a properly sized UV unit can be guaranteed to destroy the ozone to non-detectable limits, insuring the integrity of the process and the product. A dosage of 90mJ/cm2 is recommended for destruction of ozone residuals of 1.0ppm. While the addition of chlorine and chloramines to city water may control bacteria levels, they have undesirable effects on the degradation of membrane filtration or RO. Popular methods of removal, such as carbon beds or chemical injection, have proven to be problematic. Sodium metabisulfite involves replacing one chemical with another and creates food for micro-organisms, while carbon beds can be inefficient, vulnerable to channelling and provide breeding grounds for micro-organisms. Aquafine Corporation pioneered the technology of chlorine and chloramine removal, so with local help from KK Water we can provide UV water filtering systems for pre-membrane filtration and/or RO make-up water systems.